I'm in with a super quick post this morning. 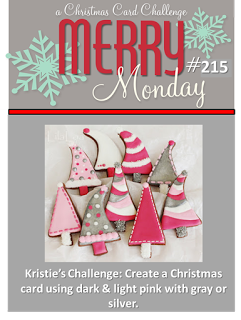 I recently found a new challenge that I want to participate in called Merry Monday. This is a Christmas Card Challenge Blog and the idea is that by the time you send out your Christmas cards, you will have at least one a week ready to go and a nice little stash built up. And if you don't send quite that many it's still nice to have a little stash to sell (if that's what you do) or for a last minute dinner invitation or that kind of thing because everyone appreciates getting a card. 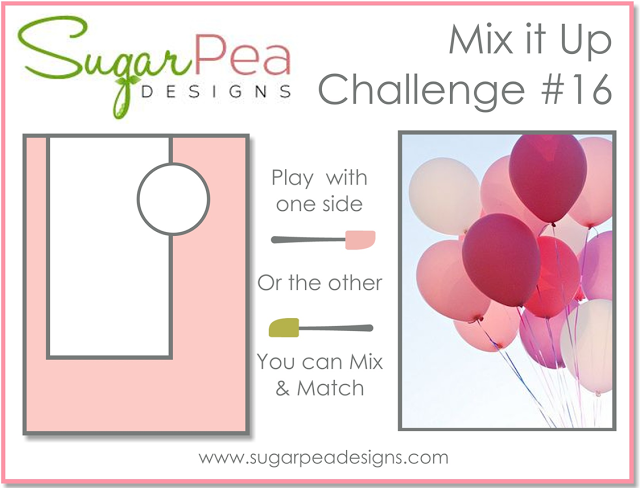 The challenge for this week is to use light and dark pink with silver or gray. I did both -- shiny silver and also shimmery gray cardstock. First I stamped the What the Doodle Ornament from Papertrey Ink in Versamark onto Canson Bristol #140 Watercolor Paper and heat embossed it using Fine Detail Silver Embossing Powder from Judikins. I have had mine forever and it's still nearly full because I use a lot more gold than silver embossing powder. I used a couple of Zig Clean Color Real Brush Pens in Pale Rose and Light Pink with a water brush to color the ornaments. The branches are a Tim Holtz Sizzix Die called Holiday Greens cut from some pearlescent evergreen cardstock that came from my scrap bin. I cut the pearlescent grey cardstock panel to 4 x 5.25 and dry embossed it using the Musical Flourish Cuttlebug Embossing Folder and mounted that to a card base made from Autumn Rose Cardstock. The ornaments were given a coat of Clear Wink of Stella once the watercolor was dry. This card came together really quickly because it is similar to the design I am planning to use for some of my Christmas Cards this year. The silver details don't photograph all that well and I am planning to use gold accents for the other cards I'll be making in this design. Y'all know how much I love Pink and Gold, Purple and Gold, or heck, just gold! Metallic Gold is the perfect neutral to go with everything! But it was fun to do something that I normally wouldn't choose. Thanks so much for stopping by today and be sure to check out the What The Doodle Ornament at Papertrey Ink. There is also a coordinating die set and Papertrey is having trouble keeping it in stock at this point. I appreciate and treasure all of your kind and encouraging comments. Have a great weekend everyone! 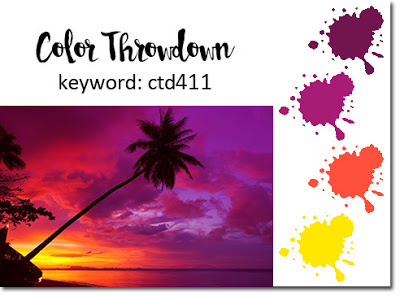 We have some absolutely gorgeous colors for this week's Color Throwdown Challenge #412. While this has been one of the more tedious cards I've ever made, it was definitely worth the effort I put in to it. I'm pretty sure I am not the only crafter or card maker out there who has a stash of Prima flowers. While I didn't use a stamp set today, my card was completely inspired by the Simon Says Stamp Stamptember set called Hydrangea Blooms. When I got mine out to use it this morning, I realized I had a branch die that was nearly identical in looks but a bit longer and I also have rows of jars sitting on shelves just full of Prima Flowers that I could use for this technique. So, using the stamp set as my guide, I set about creating some 3D Hydrangea branches for my card. To begin with, I still had some card stock that was misted with some Pine Feather Color Spray I had made and added Gold Shimmer Mist to after the color had a chance to dry. Those scraps were still on my work surface, just laying there. Since they were made with such a dark green ink, the were the perfect color for my Hydrangea branches. I also had enough of this same dark green paper to cut out 4 of the leaves from the Simon Says Stamp Hydrangea Blooms Coordinating Dies. The leaves are such a distinctive shape and I felt it was important to incorporate them. Next I gathered some of the Primas in Peach and Pink, using both small and large blooms and misted them in a coordinating color spray for a deeper, richer color. I have several color sprays made up in favorite colors so they are ready to go when I need one. I have a bright Pink, Coral, Sugarplum, Aqua and Dark Green. These are the colors I use most often and I re-purpose Shimmer Mist bottles after I empty the original contents. Once the color spray was dry, I gave them a spritz with my shimmer mist (of course) and set them aside to dry again. While I was waiting for that, I did some ink blending on a piece of Fabriano #140 Watercolor Paper. I don't care too much for this paper because of it's color (cream vs. white) but it takes a lot of water or moisture very well and if I'm doing ink blending, the original color won't show anyway. I used Salty Ocean and Lucky Clover Distress Inks to do my background panel. As I usually do, I gave it a healthy dose of Iridescent Gold Shimmer Spritz to help move and blend the colors. While this panel was just slightly damp, I ran it though my Die Cutting machine with a sandwich in this order from bottom to top: A Plate, B Plate, Embossing Pad, background panel right side up and an unmarked B Plate over the top. This is an Embossing Sandwich that you will run through your machine. If you use a cutting pad that has cut marks in it for you top layer of the sandwich, those marks will transfer to your paper, so you want to keep an unmarked cutting pad set aside for just this purpose. This really smooths out the texture in the paper and flattens it to minimize warping. I discovered this quite by accident last December when I was working on a project for my sister-in-law, Vickie, but I have kept an unmarked cutting pad since that time for this purpose. Some people will not want to remove the texture but this is how I do it. Before I started assembling my card, I cut this panel with the largest Simon Says Stamp Stitched Rectangle. I used the Simon Says Stamp "Hello" and Bazzill Whirlypop Card Shoppe Cardstock for my card base. Then I began putting my layers of blooms onto the branches using the larger Primas on the bottom layer and the smaller ones for the upper layers. Once I had all of those attached using Glue Dots, I went back to each one and put a little pearl on there. I must say, that was an important finishing touch for this card. 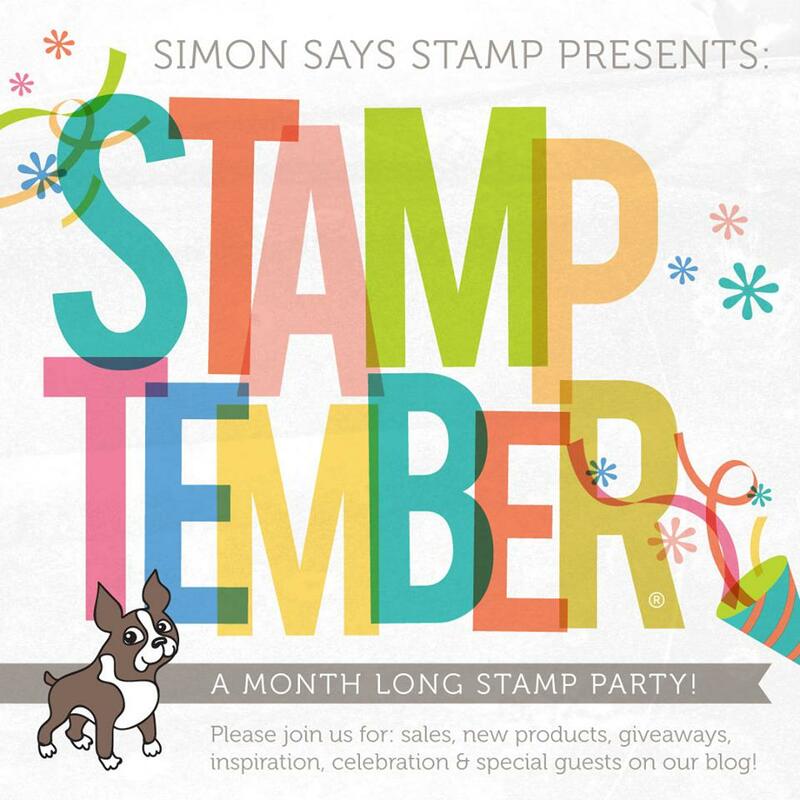 I was inspired by and used several different Simon Says Stamp products so I will also be linking up to this week's Simon Says Stamp Wednesday Challenge which is "Anything Goes". I hope I've inspired you to get out some of your crafty stash and use it to see what you can create. When I first got this idea in my head, I wasn't sure it would work out as I had pictured but I am so glad it did. Be sure to stop over at The Color Throwdown Blog and be inspired by all the projects from their Design Team and Challenge Participants. It's always fun to see how many different ways and styles the same color palette can be used. Thank you so much for stopping by to see my project today. I appreciate that you took time to look and for your kind and encouraging comments. It means the world to me when you take the time to comment. Today I'm participating over at the "Less is More" Challenge Blog and the Recipe Ingredient we're supposed to use is adding thread to our project. They have some examples from the design team there but as soon as I read what the challenge is for this week I knew I wanted to do a bit of Spirelli. Spirelli is a type of string art where string is stitched through holes rather than normal string art which is thread, wire or string that is wrapped around nails or pins. Spirelli is definitely the way to go for any kind of paper crafting. Papertrey Ink has a tutorial by Amy Sheffer on their YouTube Channel here. 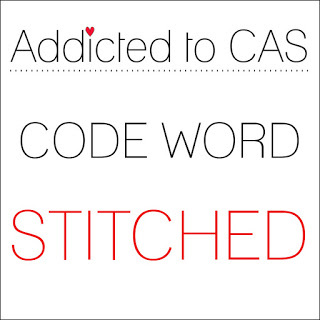 I'll also be playing at Addicted the CAS with their challenge of "Stitched". I started with one of the marbled backgrounds I created a few weeks ago using shaving foam and reinkers. While I was playing with different colors of reinkers, this is one combination that I really liked and uses New Leaf and Berry Sorbet from Papertrey Ink. I still have several of these backgrounds to use in a variety of colors. I'm not 100% certain that my card will qualify as clean and simple but since everything is adhered directly to the card base and not popped up on foam, I think it will be okay. The little doily medallions I used are from My Favorite Things and are perfect for this technique. All the "stitching" is done using Gold Thread but you can also use Gold Floss. The leaves are from a Memory Box die that is currently MIA. I know it's somewhere on my desk. I used Berry Sorbet Cardstock for the card base and flowers along with a mat of gold cardstock. The Hello greeting is a Simon Says Stamp Exclusive. This was a quick and easy card and I enjoyed taking time to do the Spirelli instead of a coloring technique this time. Thank you so much for spending a few minutes with me today. Be sure to watch the video tutorial at the link provided if you are interested in trying this technique. "Sometimes when an artist keeps things simple, that is when they are most creative. This month we are sticking to the basics. 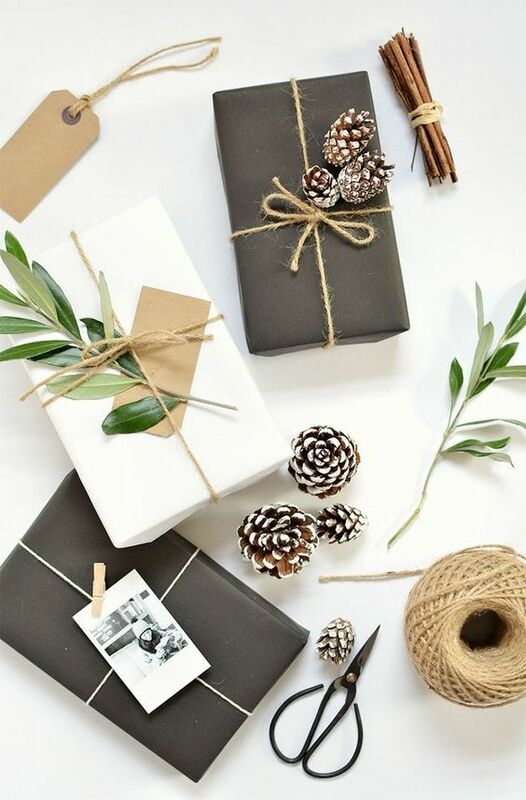 A little twine, Kraft paper, crisp black, sprigs of greenery, perhaps even a few pine cones. Mix and match these elements to create your own paper crafty project. Make a Kraft tag to frame your sentiment. Use a mini clothespin to clip a die-cut in place. Finish a length of twine with a basic bow. Let the inspiration [photo] be your guide and allow your creativity to flow!" Everything about this image is crisp, clean and simple so I wanted my card to be the same. I started with a Classic Kraft Cardstock top folding card base and a 4 x 5.25 inch Stitched Rectangle panel of True Black Cardstock. I also cut three tags from Kraft Cardstock using the tag die from Love Showers Die Set and three Banners from the Paper Clippings: Happy Birthday Details Dies. I glued each of the three tags and each of the three banners, one on top of the other to make them nice, thick elements. I feel this adds to the more masculine look of this card which is intended for a nephew's birthday. I die cut the Happy Birthday die which came from Penny Black some time ago using gold foil cardstock to help pick up the gold shimmer in the leaves. Because of how slender the letters are in the die cut, it was easy to align them along the stitching line in the banner and give them a slight curve kind of like you do if you want to add a curve to your sentiment stamps. For the leaves, I made some color spray using Pine Feather Reinker in a little spray bottle and sprayed watercolor cardstock with it. I have a pretty heavy concentration of ink in my spray so the leaves would be dark green. Once the paper dried, I misted it all over with Iridescent Gold Shimmer Spritz and let it dry again. The shimmer spritz I'm using is from Tattered Angels which is no longer made but you'll find that this Tsukineko Sheer Gold Shimmer Spritz works the same and has the same look. Next, I cut the leaves out using a Memory Box Slender Leaves Die. This is an older die that is no longer available but has three leaves on the stem and also embosses when it cuts. I cut several of these so I could arrange them how I wanted on my tag and adhered them using Ranger Multi Medium Matte. I really love the pine cones, clothespin and the little bundle of cinnamon sticks in the inspiration image, but I felt any more elements would be too distracting for a clean and simple design. Trust me, it was not that easy seeing as how I have the new Holiday Greens Stamps and Dies in the house! I used a length of Natural colored Hemp Cord for the tag. Be sure to pop over to Papertrey Ink Blog to see all of the projects along the blog hop. Thanks very much for your kind and encouraging comments! The Color Throwdown Challenge Blog has some gorgeous colors chosen for this weeks Challenge; Purple, Magenta, Orange & Yellow. They use generic names so everyone can work with colors they already have and not have to go out and buy anything special. If you've been around my blog at all, then you know I love using Gold. Two of my favorite tools in my studio are Finetec Mica Gold Watercolors and Iridescent Gold Shimmer Spritz and that is what I used for my Yellow. The one I have is no longer being made but this Tsukineko Sheer Gold Shimmer Spritz is what I will use when mine is completely gone. Thankfully, I have several more bottles. To create my card, I started with a Stitched Rectangle cut from Papertrey's Fresh Snow Linen Cardstock. This immediately gives my background some texture but I really wanted a lot of texture. Using some color sprays made using reinkers, I misted that panel with Purple and Orange Sprays. Once those colors were spritzed on there, I gave the whole panel a good spritzing with Iridescent Gold Shimmer Spritz then set it aside to work on my balloons. I started with a piece of Watercolor Paper and did some very random ink blending using Distress Inks in Seedless Preserves, Picked Raspberry and Abandoned Coral. Again, I spritzed the panel with Iridescent Gold Shimmer Spritz. Once that was dry, I used Balloon Bash Dies to cut the balloons. Using some Metallic Gold DMC Floss, I made the strings for the balloons by attaching the string on the backside using Ranger Multi Medium Matte and then reinforcing that with a foam square since I was planning to mount everything but the background with Foam Squares. I die cut the banner from the Tag Sale: Quilted Die and mounted the Penny Black "Happy Birthday" die cut on that with Ranger Multi Medium Matte. All my pieces were cut and ready to assemble, but I wanted a bit more interest and texture on my background panel so using the end of the sprayer nozzle from the purple color spray I made spatter by tapping a brush handle on the top part of the sprayer. I also used my Finetec Mica Gold Watercolors in Gold Pearl to create some gold spatter as well then assembled my card onto a Blackberry Bliss A2 Top Folding Card Base. I wish I had been able to capture all the shimmer and shine. I did my best, but my image falls far short of the reality. Trust me - you can definitely see it in real life. All of the supplies I used are linked unless they are no longer available. Wishing you all a happy Saturday and I hope you come back soon! 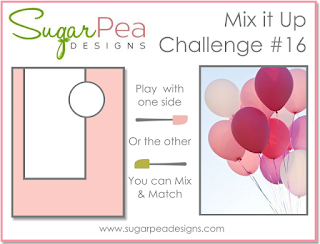 This card will also be entered at the Sugar Pea Designs Mix It Up Challenge #16. The graphic on the left is the inspiration image for that challenge. They have some great stamps and dies although I don't have any of them yet. Simon Says Stamp is carrying Sugar Pea Designs now so you can click the link in my sidebar if you like! Just type Sugar Pea into the search window and you'll get a whole bunch of them. 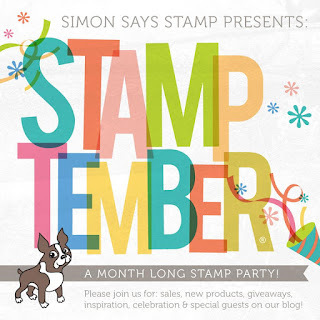 The Simon Says Stamp Wednesday Challenge Blog has a "Gift It" theme this week. This was great because I wanted to try out a stamp set called Gifts of the Season that was released in September at Papertrey Ink. There is a set of Coordinating Dies as well. While it was released with the Christmas goodies, it can also be used for birthdays depending on how you do it. One of the really fun things about this set is that you only need two stamps to do this whole stack of presents. I took my idea from Betsy Veldman and stamped one of my layers in Versamark and then heat set it using Simon Says Stamp Antique Gold Embossing Powder. The ink I used here is Hibiscus Burst. I adore Pink and Gold together in just about any form I can find it in. I have several colors and styles of this gold foiled paper by Paper Studio (Hobby Lobby's brand). The gold foiled polka dots of this one made such a fun background for my presents. The banner is from Paper Clippings: Happy Birthday Details Dies. I love it and use it as often as I can. The sentiment is an older die from Penny Black. There's no special techniqes here, I stamped and die cut the stack of presents, and die cut the other elements. I used Simon Says Stamp Stitched Rectangles Dies to cut the mat for the card and everything is assembled to a top folding A2 card base made from Stamper's Select White Cardstock. I'm currently trying to decide whether or not to use props in my photographs. Several of my favorite bloggers do and I often like the look they've captured but I don't want the props to be more important than the card, so I am still undecided. I also don't want to spend stamp & die money buying a lot of props, so I am trying to keep it simple and affordable. That said, I did get a few fun ones for the upcoming holiday season. Lighting gets a bit trickier with the added elements as well, so y'all will have to share your thoughts on this. 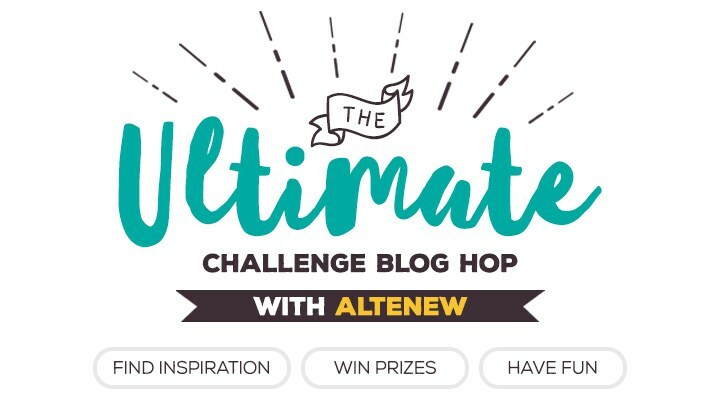 I was so excited when I found a blog hop today for a project that I finished this morning for another challenge only to discover that I was too late to post in the challenge. That sure took the wind out of my sails for a couple of minutes. So it was a nice surprise to stumble across "Coffee Loving Cardmakers" blog and see that there is a new challenge that started today. I was wishing I had saved my blog post though and not deleted it but that's the breaks of the game; onward and upward as they say. The image on the left was my original inspiration for this card in case you're wondering about why I used a wood grain panel. I'm happy with how it turned out. I used a piece of watercolor paper to dry emboss the wood grain pattern. Once that was done, I used Kraft Ink from Papertrey Ink direct to paper then gave the whole piece a good spritzing with Iridescent Gold Shimmer Mist and set it aside to let it dry while I worked on the rest of my card. The stamp set I used here is a oldie but goody called "Coffee Shop" from Close To My Heart and is several years old -- maybe as much as 10 years old. It also has Hot Chocolate and Coffee words as well. I made this for my Pumpkin Spice loving girlfriend, Jenica. I love my Mocha Cappuccino as much as she likes her Pumpkin Spice. I know so many people who love to get Pumpkin Spice Coffee but for me, Chocolate is still King! The images are all stamped in Versamark and Heat Embossed on Canson Bristol Watercolor Paper using Simon Says Stamp Antique Gold Embossing Powder. The "Perfect" die cut word is a die from Waffle Flower Crafts but the font matches the stamp set so well that it was a no brainer. I water colored the Cup of Cappuccino with the Zig Clean Color Real Brush Markers in Light Blue and Cobalt Blue. Both the background panel and the front panel were cut with Simon Says Stamp Stitched Rectangle Dies. I have a definite preference for clean lines and graphics. 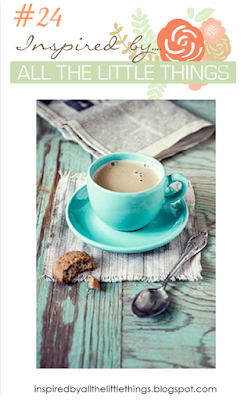 There are a ton of coffee inspired images over on the Coffee Loving Cardmakers Blog so be sure to check them out. I'm thinking I may have to get one of those modern looking cup stamp sets so maybe I'll get lucky and win one of the gift certificates that their sponsors have given for this blog hop. Thanks so much for stopping by. I appreciate your encouraging and uplifting comments. Have a great weekend, everyone! This week over at Papertrey Ink Blog, Betsy Veldman gave us some tips for using our floral stamps to create a masculine card in her Make It Monday #261 Video. For the card I created, I used Friendly Flowers Stamp Set in addition to a sentiment from Mums the Word, some of the stamps, stencils and die cuts from the Color Pop: Autumn Kit and even the acorns from the Give Thanks Stamp Set. I selected a piece of patterned paper in a stripe from some of the samples that have been sent to me in cards from Papertrey Forum Members. I don't have any wood grain paper like Betsy used so I had to find a substitute and felt the colors would work great for my project. I should probably tell you up front that I did try to use cream cardstock for my stamped and die cut pieces but the one I have is not from Papertrey Ink and I felt that it was too yellow to work here so I opted to go for the white. I cut about a third of the striped paper off so that I would have an area that naturally drew the eye. I attached the striped paper to a top folding card base made from Ocean Tides Card Stock. I started by die cutting the different elements I was planning to use. I cut the two largest leaves from the Color Pop Autumn Kit and then I used the stencils from the kit to sponge on color in Melon Berry and Ocean Tides. The detail layer was stamped on the die cuts in Americana and Pine Feather Inks. I really love the way these colors worked with the sponged color. Next, I cut several circles with the My Favorite Things Stitched Circles Stax Dies and stamped them with one of the flower stamps from Friendly Flowers. Since I used a circle instead of the flower shaped die cut, they just look like spokes and not really like flowers at all. It's just another way to stretch your your stamps. The colors I used for this are Dark Chocolate and Ocean Tides. I tried several colors such as Kraft, Cocoa Bean and Fine Linen but I felt the Dark Chocolate looked the best with my other color choices. For the last two elements, I stamped the acorns from the Give Thanks Stamp Set, also in Dark Chocolate, and the greeting from Mums the Word in Pine Feather Ink. I used an acrylic block for all of the stamping except the sentiment and I did that in the MISTI so that I could double stamp it for extra crispness with no problems lining it up. I love having the option to use either but for things that don't need to be exact I still like using an acrylic block. I used the Number the Stars Banner Die to cut the sentiment out. I attached both of these elements with Foam Squares. I really like the font from the Mums the Word Stamp Set. The more scroll-y or flourish-y looking fonts just don't look as masculine as this classic one. I used one of these sentiments for my brother's birthday card and was happy with that result as well. Thanks so much for coming by to check out my project. I hope you enjoy my take on the challenge and will be inspired to create something of your own. Hello everyone! It's time for the Papertrey Ink Create Along With Us Challenge for September 2016. As always, we can use anything created by the Design Team during release week as our inspiration and there was plenty to choose from. Truly, the Papertrey Ink Design Team (we call them the Dream Team) is just the best. Each has their own style but I continue to be amazed by all of them. 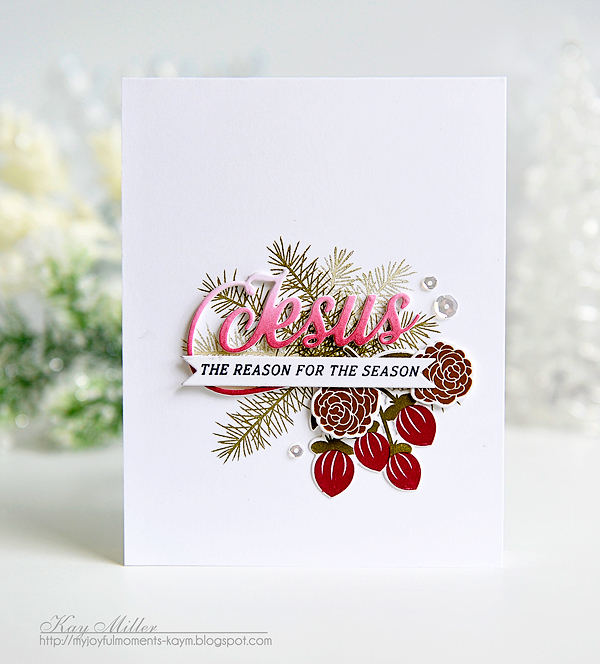 I chose a card by Kay Miller (who I confess is one of my favorite designers) this month as my inspriation for this challenge. I had recently made a card that used Dark Chocolate Ink with Scarlet Jewel Ink and I loved the combination so when I saw Kay's card, it was a no brainer. Obviously, no one outside of the Design Team has the new stamps or dies yet, but I was only drawing my inspiration from her color choices at this time. You can bet I will be trying to recreate a similar look once I get the Holiday Greens Stamps and Dies. I started by die cutting the branches from Peaceful Pinecones Dies out of Stamper's Select White Cardstock. I just cut a few of each and then stamped them with the Peaceful Pinecones Stamp Set using selective inking for the green and brown branches. Since I'm using ink cubes rather than pads, this was pretty easy to do. I inked up the branch base using a corner of the Dark Chocolate Ink Pad and the same way for the pine needles part of the pine branch using Pine Feather Ink. I know I'm going to be using Pine Feather a lot with the upcoming holiday season and I made sure I will have plenty of that color by ordering a reinker. For my card, I wanted to use a sentiment from the Give Thanks Stamp Set so I also used a couple of stamps from there just to add a bit of the Scarlet Jewel to my arrangement. I would have like to used Spruce and Sprigs Stamp Set for the berries, but I don't have that so I made do with what I could find that was an elongated shape. I think it worked out pretty well and I can't wait to get my Holiday Greens Stamps and Dies from this month's release. You can see the full release and details on Nichole Heady's Blog. I made my arrangment on top of the largest Simon Says Stamp Stitched Rectangles die cut panel and then picked it up with my piece of Press 'N Seal to keep it in tact while I did a bit of ink blending on the background. There's just a hint of Pale Peony there and in hindsight, I could have done a bit more to make a larger area, but it's okay. This is a design that I will use again. The acorns on the top are also from the Give Thanks Stamp Set and I added them to the top of the arrangement with Thin 3D Foam Squares. The Give Thanks Coordinating Dies makes it super easy. I wanted to keep the card fairly flat for mailing purposes so I didn't use much foam adhesive. 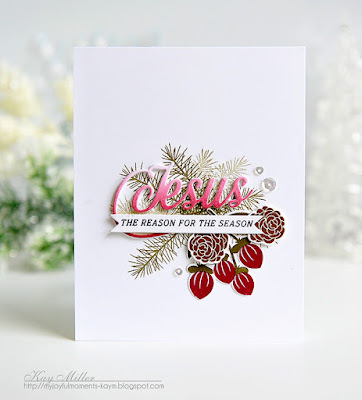 The greeting is heat embossed using Simon Says Stamp Antique Gold Embossing Powder. I also cut another stitched rectangle for the inside of the card. This creates such a nice, finished look on the Scarlet Jewel Cardstock base. Be sure to stop by Nichole Heady's blog to take a look at all of the release inspired projects. What a talented group we are! It's been a hectic week for me and I haven't gotten as many projects done as I would have liked but I appreciate you stopping by and even more so when you take time to comment. I'll see you all again soon but not until next week. We're heading out to a car show tomorrow so I won't be near my studio all weekend. Have a great weekend everyone! 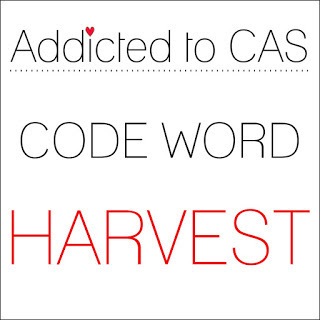 One of the challenges I like to participate in every month is the CAS Mix-Up Challenge with Bonnie and Loll. It's always fantastic to see all the entries in this challenge and I often learn a new technique when participating. 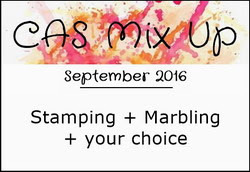 This month the Challenge is to use Stamping, Marbling and my choice which means I am definitely planning to use some "spray" (Shimmer Spritz). Having only done this technique once many years ago, I wanted to play a bit to refresh my memory about a few different things and try it in some new ways. So I used cardstock, glossy cardstock and watercolor paper for my marbling and I definitely learned a thing or two along the way. The most important thing was learning not to mess with it too much or you'll lose your white space. It's pretty easy to get the first couple of panels marbled but as you re-use that bit of shaving foam, it gets more and more mixed up and you don't have as much clean foam left to preserve the white space. It's all in whatever you like. I just happened to find that I like to preserve some of the white. Watercolor paper took the color okay, but it wasn't worth the extra cost. Glossy cardstock didn't take the color very well at all but if you wanted something subtle, it would be a good option. The shaving foam is only the medium which carries the ink to your cardstock. This is the one thing that I take to my kitchen to do rather than doing it in my studio. I have good counter space there and all the necessary items; a cookie sheet or paper plate, a sink and paper towels. Since you need to get enough shaving foam to do the job, you might just as well do some additional marbled panels while you're at it. I did a few yesterday and a few today. Start by putting some shaving foam down in the bottom of a paper plate or cookie sheet. If you use a cookie sheet, you can put down a piece of waxed paper to keep the mess contained better. This is the cheapest can of shaving foam there is -- 98¢ at Walmart. As long as it is foam, not lotion or gel, it works. The next step is to add a few drops of re-inker in whatever coordinating colors you want to use. Just add them randomly. Mine is a combination of Vintage Jadeite and Tropical Teal and I could have used more of the Jadeite. Find something to swirl the ink around in the foam with. I used a plastic fork, but you could use any kind of plastic silverware, a bamboo skewer or just something long enough not to be dragging your hand around it. A toothpick isn't tall enough. But silverware washes so you could use that and just wash it off. It is ink after all and will stain your clothes or fingers so be careful. Make sure not to over mix -- if you want white space in your panel, you have to have some of the foam still be white. I found I liked my results best when I had lots of streaks of color. Each time you pile that foam back up to mash your card panel into, the color mixes a bit more. I can easily do 4 panels with each plate of foam. You could probably do more if you wanted to use them for some kind of mass production such as note cards you're making to give as a gift. Four panels is plenty for my needs and I did a few different color combinations as well so all together I have 12 of them now. Here's an example of the first one I did in the teal and green with the last one I did. As you pile the shaving foam back up to put your next cardstock panel into, the foam and ink gets more mixed up and there is less white space. I like both looks. 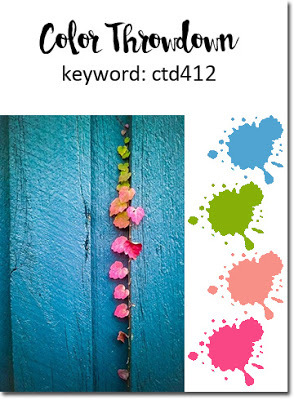 It's a fun way to bring a ton of color to your card and make people wonder how you did that. I personally feel that 3 colors is about the most you can use or it starts getting too distracting. Once you've put your cardstock down into the foam, lift it up by the corner and start scraping the foam off with a knife or scraper. I have a Pampered Chef scraper that I use and that's perfect as it's wider than the width of a card. Your paper will need to dry, but it's not very damp. If it curls up a bit, just run it through your die cutting machine when it dries with the embossing sandwich, making sure the pretty side of your panel is the side that is facing the uncut cutting plate. If you use a cutting plate that has cut marks on it, those will transfer to your paper. Again, I keep an unmarked cutting plate separate from the rest of my die cutting plates to use only for this purpose. Since I like to douse almost every background panel in some type of shimmer mist, I do the flattening exercise a lot! If I kept the unmarked pad laying there, I would eventually accidentally pick it up and use it and not realize until it was too late. This is a super easy technique, just a bit messy. I clean as I go to avoid accidental contact with something not intended. To put the rest of my card together I stamped the blooms from Altenew's Beautiful Day with Versamark, Heat embossed them with Simon Says Stamp Antique Gold Embossing Powder, and used a technique I call "Watercolor Detail Stamping" using Peacock Feathers Distress Ink. I also stamped and heat embossed the leaves with the same embossing powder onto Vintage Jadeite Cardstock so that I would have exactly the right color to match my background. I cut the pieces out with the Beautiful Day Coordinating Dies. The sentiment is from the Altenew Sentiments and Quotes Stamp Set and is a favorite. The gold accent piece is cut from Spellbinders Labels 42 and Labels 42 Decorative Elements. They fit snugly into each other. Everything is attached to a Rustic White Top Folding Card Base. 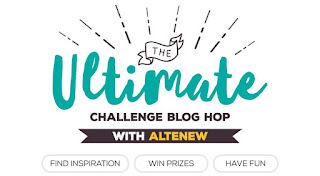 In addition to entering the CAS Mix Up Challenge, I am entering this into the Altenew Ultimate Blog Hop Challenge and the Simon Says Stamp Wednesday Challenge with the theme of Clean and Simple. Thank you so much for stopping by today to check out my blog post. I hope you'll give this technique a try and if you do, let me know what colors you used that you liked. I'm about to start the note card sets that I give to my sisters-in-law for Christmas and would love to hear some of your color combinations. I appreciate every positive and encouraging comment you leave for me. I'll be back soon as I have several other projects on my desk right now. Sketch Ranunculus with Simon Says "Stamp It"
I've got a quick post this morning because I made a very similar card a few days ago. You can find it here. I made this card in these specific colors for a friends' birthday which happens to be today. This card features a watercolored background created by smooshing Vintage Jadeite and Tropical Teal Inks onto my craft mat and spritzing it generously with Iridescent Gold Shimmer Spritz. I promise, I did not use any yellow ink here; only the gold shimmer spray. The background panel was cut using the largest Simon Says Stamp Stitched Rectangles Die. I stamped the blooms and other stems from the Sketch Ranunculus Stamp Set in Versamark and heat set them Simon Says Stamp Antique Gold Embossing Powder and watercolored them using reinkers and a water brush in the same colors as the background; Tropical Teal and Vintage Jadeite. Once they were dry I misted them with some sheer shimmer spritz and let them dry completely so I could die cut them with the Sketch Ranunculus Coordinating Dies. I assembled everything onto a top folding horizontal card base made from Stamper's Select White using a combination of Thin 3D Foam Squares and Ranger Multi Medium Matte. I used a few Gold and Peacock Sequins to embellish. I'm entering this card into the Simon Says Stamp Wednesday Challenge and the Simon Says Stamp Flickr Challenge #53 although I still need to post it over at the Wednesday Challenge Blog. I'll be back later today with a fun technique that I tried out this past weekend. See you again soon and thanks so much for stopping by! I started a project Thursday afternoon and as sometimes happens, it took on a life of its own. I will often make 2 or 3 cards in the same or similar style while I have those particular supplies out and that day was no exception. I can change up the colors easily enough because with watercolor no two images are the same even if you try. I love watercolor and watercolor techniques and I'm still trying different techniques to see the results. That was probably the biggest thing I had to learn when I started trying to incorporate watercolor into my work. You have to relax and try different things and be willing to use some things for purposes not originally intended. 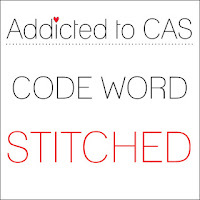 This is how I came to be working on a project for the Addicted to Clean & Simple Challenge. On Thursday, I got a fantastic surprise in the mail from my friend, Yana Smakula. One of my favorite of her cards featuring Altenew's Magnolias for Her Stamps and Coordinating Dies was delivered by my postal carrier. To say I am over the moon to get one of Yana's cards is putting it mildly! While there are many designers whose work I like, I think Yana is the one I most want to be like. Her love for Gold equals my own although neither of us use it 100% of the time. But it is a go to for both of us to instantly add a bit of elegance to a project. If you aren't familiar with Yana's work, I linked her name above to her blog or there is a link to her blog on my sidebar where you can see more and she does fantastic YouTube Videos as well. I was playing around with some ink "smooshing" in some "different for me" kinds of colors and while I didn't care for what I did as a background panel, I couldn't help but think of what lovely fall leaves they would make. I love the Color Pop Autumn Kit that Papertrey Ink released last month, but I've had these My Favorite Things Falling Leaves Dies that I've been wanting to try out and they were absolutely perfect for creating these leaves. A lot of the trick for getting these well blended colors is an abundance of liquid, or in my case shimmer spritz, added to your watercolor paper. I used several types of watercolor paper here and I can't honestly say that I think one is better than the other in this particular application. Since I wasn't dragging a brush back and forth over the top, it all held up fine without pilling. I knew I was going to let it just sit to air dry for a while. The Arches Hot Pressed took the longest to dry as expected. I used Canson Bristol, Arches Hot Pressed, & Fabriano Cold Pressed watercolor papers. One trick I like to use for heavily textured watercolor paper (such as the Fabriano) is running the very slightly damp paper through my die cutting machine with an unmarked, uncut plate on the top and the embossing pad to help flatten it out. If you use a cutting plate that has marks in it, those marks will end up on your panel. The embossing pad won't leave marks, but it does not make it as smooth as an unmarked cutting pad. I have a cutting plate just for this purpose and I keep it in a separate place so that I don't accidentally cut into it (the voice of experience again). Once I saw the card that Yana had sent me, I really wanted to try shaping my leaves in the same manner so I had to ask her a couple of questions about how she did it. Now, I've watched her do it in YouTube Videos but the reality (as always) and seeing it in person was even better. It took my breath away when I took it out of the box she sent it in, so I absolutely wanted to mimic that look. To achieve this, it is better to do it when your paper is slightly damp or you can give it a light mist of water. I didn't want to get mine too wet because the dies I used here both cut the shape and emboss the veins but if you put too much water on it expands the previously compressed paper and takes a lot of the embossed detail out. Once I had all of my leaves die cut and shaped, I made two card bases; one from Kraft and one from Dark Chocolate Cardstock. I also cut a Simon Says Stamp Stitched Rectangle from Scarlet Jewel Cardstock in the largest size to use as a mat for the Kraft card base. For the Dark Chocolate card, I used the Noted: A2 Scalloped Die to cut my card base, then I cut the "Bountiful" die cut from the Color Pop Autumn Kit out of Gold Metallic Cardstock and placed it on a Paper Clippings: Birthday Details Banner cut from Rustic White Cardstock. I placed my leaves going from the upper left to upper right and upper left to lower left. Since this is a birthday card for my brother, I didn't put any sequins or shimmer on the card. After I finished assembling it, I wondered if the Scalloped Notecard was too much but my husband said it was fine. I guess we shall see. I still have several leaves left for additional projects. I put them in the stamp pocket with the dies so that when I need them again, I can find them. This completes my projects for today and for the Addicted to Clean & Simple Challenge. Thank you so much for stopping by and checking out my projects. I really love it when you take time to share your thoughts with me. I have a few of those products and one I've been waiting to use because I didn't have the coordinating dies. In fact, the coordinating dies weren't offered initially at all. But I had a small order last week and that arrived yesterday and the coordinating dies were in that package. At long last, I got to use the Sketch Ranunculus Stamps and Dies from Simon Says Stamp. You can buy them separately or together. The problem is that since I like Gold Heat Embossing, that is really hard to do using masking. So I have a lot more success heat embossing my images individually, coloring them, die cutting them and finally, assembling them into a bouquet on my card. That is what I did for today's card. Those of us who work in this industry are fortunate to have really great companies to work with. I have one such person that I want to send a card to, thanking her for all she does. Everyone enjoys hearing that they are doing something right or well or great. I'm one of those people who likes to encourage or acknowledge when someone is doing that. I started by stamping the Ranunculus blooms and accompanying leaves and stems in Versamark, heat embossing them in Simon Says Stamp Antique Gold Embossing Powder, then watercoloring them using reinkers as my watercolors. This is quickly becoming a favorite way to watercolor. For the flowers I used Hibiscus Burst and Berry Sorbet along with Vintage Jadeite for the leaves. The background is one of the many that I made last week utilizing my Finetec Mica Gold Watercolor rinse water. You can see for yourself why I was reluctant to pour this water down the drain - look at all that shimmer and shine! You can read more details about it here. I still have 3 more backgrounds to use from all that I made that night (12 in total). In fact, I am wanting to do this same style and design in a different color scheme for another card I have in mind. I positioned all of my elements on top of the background panel, then put a piece of Press N Seal on top of that and pressed all around. This lets me lift the arrangement off while keeping everything in its place. I cut the background panel with the largest Simon Says Stamp Stitched Rectangles Die and adhered that to a Top Folding 5.5 x 4.25 inch tall card base made from Stamper's Select White Cardstock. I turned the piece of Press N Seal over and put glue on the back side of all the elements using Ranger Multi Medium Matte then placed it onto my background how I wanted it and pressed down. I attached the sentiment "Grateful", a Simon Says Stamp STAMPtember 2016 die. After that I had to add a few more dots of adhesive but once I had flipped it over I just stacked some glass blocks on top to hold it while it dried. I'll have to take a picture of that for you sometime. I love how this card came out and as I said, I'm going to do a similarly styled card in a different color scheme. When you put watercolor into the mix, each card is a unique and one of a kind piece. This will finish my blog post for this card but I'll be back soon with another project. Thank you so much for stopping by and I hope if you enjoyed this project you'll leave a comment for me. I treasure each and every one. Today's post is for all three of the Simon Says Stamp Challenges; Simon Says Stamp Flickr Group Challenge #53 with a theme of "Anything Goes", Simon Says Stamp Monday Challenge with a "Stitching" theme and the Simon Says Stamp Wednesday Challenge with the theme "Anything Goes". I love the "Anything Goes" challenges because I don't have to try to make my project conform to something that might not be my style and I love the "Stitching" challenges because those are my most used Simon Says Stamp Exclusive Dies. These cards are my third project using my leftover Finetec Mica Gold Watercolor from the rinse water. The first time I used my Finetec Mica Gold Watercolors, I noticed that I was washing so much paint down the drain when I cleaned my brush so I started saving my rinse water. I have it in a container that easily lets me leave the lid open a bit to make the water evaporate and then I can reactivate it with a bit of water when I want to use it. I was playing with some inks (Orange Zest, Scarlet Jewel, and Bright Buttercup) to make some watercolor backgrounds. When I realized I had fall colors, I wanted to use my Simon Says Stamp Grand Maple Die to create some cards. This die was released last year during STAMPtember® 2015. Having lived in Hiawatha, Kansas a.k.a. The City of Beautiful Maples, I love this die. I think Hiawatha is the reason I love Fall so much. I love the gorgeous riot of color that is visible in all the maple trees every fall along with the crisp cool days and evenings with Hot Spiced Cider or Hot Cocoa. I started by cutting the Grand Maple from each panel of watercolored paper and from White Fun Foam. Using my MISTI with a negative placeholder, I stamped the greeting, "Grateful for you", using the Winnie & Walter Happiest of Holidays Stamp Set and heat embossed it using Simon Says Stamp Rose Gold Embossing Powder. To me, this powder seems more of a burgundy metallic than Rose Gold, but it was perfect for this project. Copper would also have been very pretty. Next, I cut the watercolor negatives down to 4 x 4 inch squares and mounted those onto Scarlet Jewel 4⅛ inch squares and mounted those to a top folding card base made from Cocoa Cardstock. I adhered all of the leaves to their fun foam bases with Ranger Multi Medium Matte, put a little spray adhesive on the back and placed them into the negatives on the card. This pops them up a bit for dimension but makes it better for mailing than foam tape or foam squares since it's dimension with a solid surface. I felt like the card needed something in the space below the maple leaves so I stamped the "Thankful" from the same stamp set and heat embossed it using Simon Says Stamp Antique Gold Embossing Powder this time. I did a test stamp on the Cocoa Cardstock with the Simon Says Stamp Rose Gold Embossing Powder, but it didn't show up on that color. I also didn't keep the leaves in the same negative they were cut from because I wanted that color difference to make it show better so I switched them all around.